Where R is the recovery, discEE the discounted expected exposure at time t, and PD the default probability distribution. 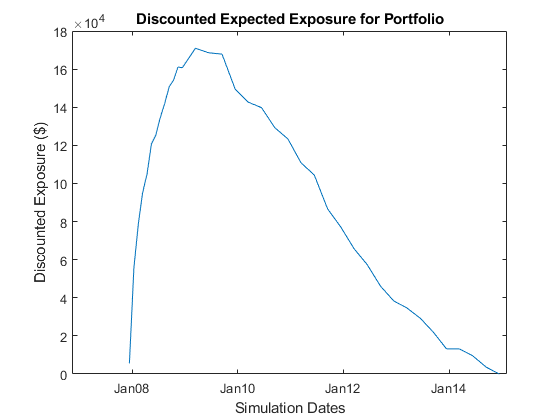 The expected exposure is computed by first simulating many future scenarios of risk factors for the given contract or portfolio. Risk factors can be interest rates, as in this example, but will differ based on the portfolio and can include FX rates, equity or commodity prices, or anything that will affect the market value of the contracts. Once a sufficient set of scenarios has been simulated, the contract or portfolio can be priced on a series of future dates for each scenario. The result is a matrix, or "cube", of contract values. These prices are converted into exposures after taking into account collateral agreements that the bank might have in place as well as netting agreements, as in this example, where the values of several contracts may offset each other, lowering their total exposure. The contract values for each scenario are discounted to compute the discounted exposures. 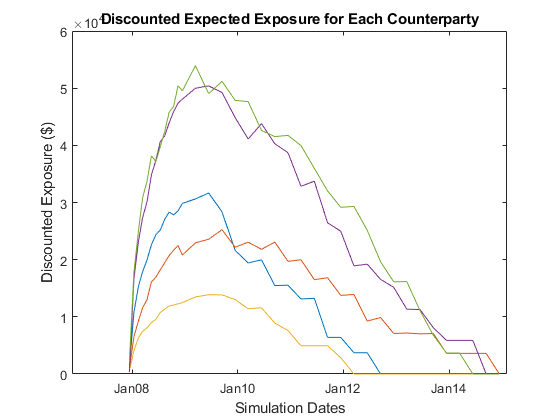 The discounted expected exposures can then be computed by a simple average of the discounted exposures at each simulation date. Finally, counterparty default probabilities are typically derived from credit default swap (CDS) market quotes and the CVA for the counterparty can be computed according to the above formula. Assume that a counterparty default is independent of its exposure (no wrong-way risk). This example demonstrates a portfolio of vanilla interest-rate swaps with the goal of computing the CVA for a particular counterparty. The portfolio of swaps is close to zero value at time t = 0. Each swap is associated with a counterparty and may or may not be included in a netting agreement. For more information on the swap parameters for CounterpartyID and NettingID, see creditexposures. For more information on the swap parameters for Principal, Maturity, LegType, LegRate, LatestFloatingRate, Period, and LegReset, see swapbyzero. You can vary the number of simulated interest-rate scenarios that you generate. This example sets the simulation dates to be more frequent at first, then turning less frequent further in the future. % Compute monthly simulation dates, then quarterly dates later. For each simulation date, compute previous floating reset date for each swap. Each scenario contains the full term structure moving forward through time, modeled at each of our selected simulation dates. Refer to the Calibrating Hull-White Model Using Market Data example in the Financial Instruments Toolbox™ Users' Guide for more details on Hull-White one-factor model calibration. 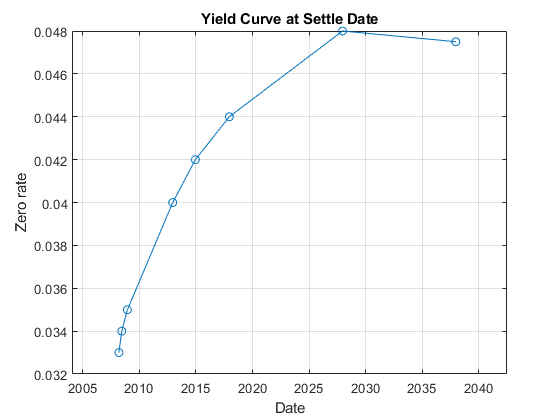 For each scenario, simulate the future interest-rate curve at each valuation date using the Hull-White one-factor interest-rate model. 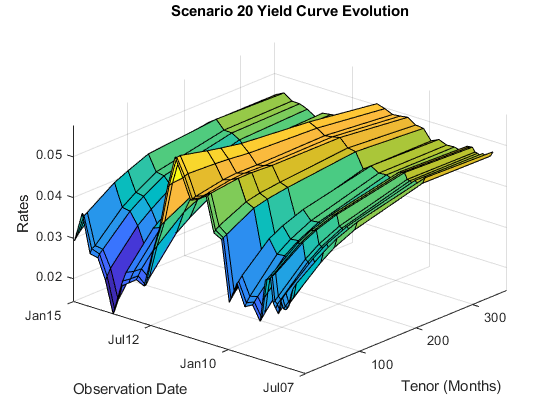 Create a surface plot of the yield curve evolution for a particular scenario. 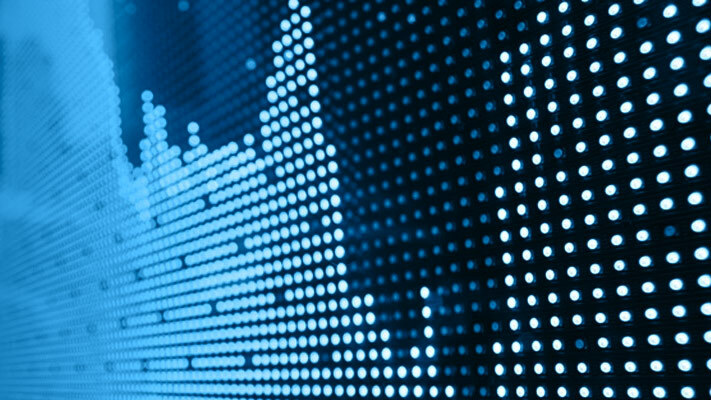 For each scenario the swap portfolio is priced at each future simulation date. Prices are computed using a price approximation function, hswapapprox. It is common in CVA applications to use simplified approximation functions when pricing contracts due to the performance requirements of these Monte Carlo simulations. Since the simulation dates do not correspond to the swaps cash flow dates (where the floating rates are reset) estimate the latest floating rate with the 1-year rate (all swaps have period 1 year) interpolated between the nearest simulated rate curves. The swap prices are then aggregated into a "cube" of values which contains all future contract values at each simulation date for each scenario. The resulting cube of contract prices is a 3-dimensional matrix where each row represents a simulation date, each column a contract, and each "page" a different simulated scenario. % approximation function here to improve performance. 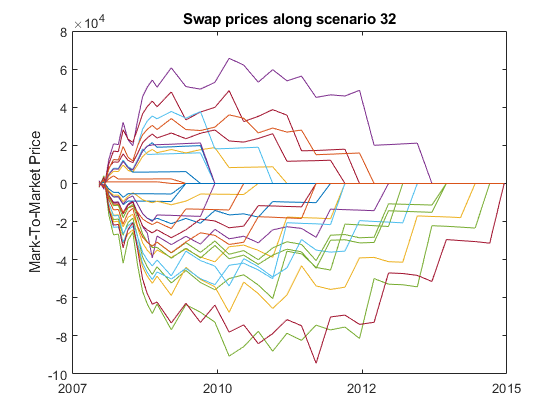 Create a plot of the evolution of all swap prices for a particular scenario. 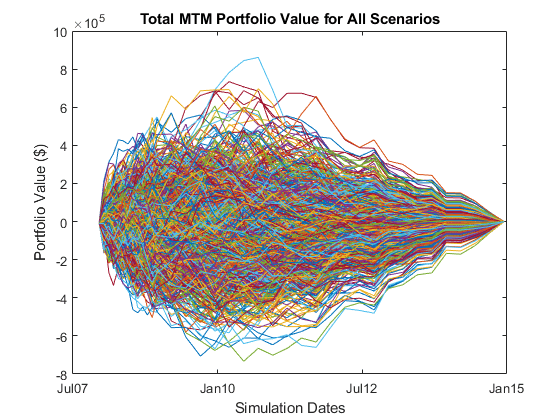 Plot the total portfolio value for each scenario of the simulation. As each scenario moves forward in time, the values of the contracts move up or down depending on how the modeled interest-rate term structure changes. As the swaps get closer to maturity, their values will begin to approach zero since the aggregate value of all remaining cash flows will decrease after each cash flow date. Compute these exposures for the entire portfolio as well as each counterparty at each simulation date using the creditexposures function. Unnetted contracts are indicated using a NaN in the NettingID vector. Exposure of an unnetted contract is equal to the market value of the contract if it has positive value, otherwise it is zero. Contracts included in a netting agreement have their values aggregated together and can offset each other. See the references for more details on computing exposure from mark-to-market contract values. 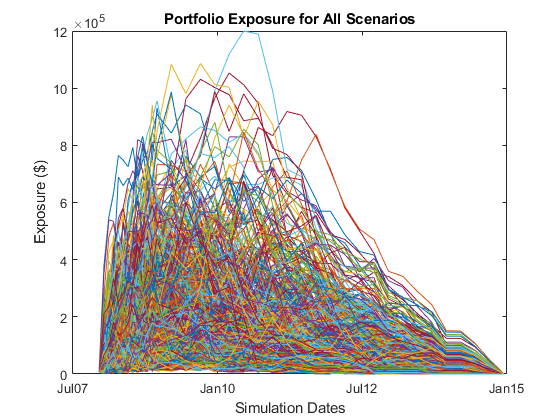 Plot the total portfolio exposure for each scenario in our simulation. Similar to the plot of contract values, the exposures for each scenario will approach zero as the swaps mature. Several exposure profiles are useful when analyzing the potential future exposure of a bank to a counterparty. Here you can compute several (non-discounted) exposure profiles per counterparty, as well as, for the entire portfolio. For further definitions, see for example the Basel II document in references. Visualize the exposure profiles, first for the entire portfolio, then for a particular counterparty. Visualize exposure profiles for a particular counterparty. 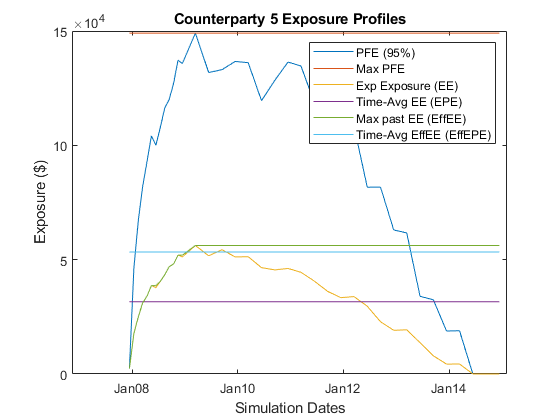 Compute the discounted expected exposures using the discount factors from each simulated interest-rate scenario. The discount factor for a given valuation date in a given scenario is the product of the incremental discount factors from one simulation date to the next, along with the interest-rate path of that scenario. 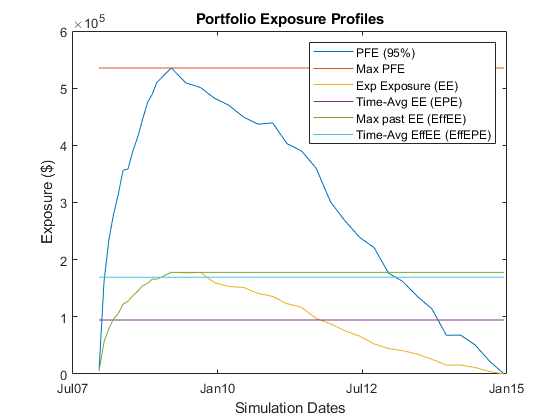 Plot the discounted expected exposures for the aggregate portfolio as well as for each counterparty. The default probability for a given counterparty is implied by the current market spreads of the counterparty's CDS. Use the function cdsbootstrap to generate the cumulative probability of default at each simulation date. 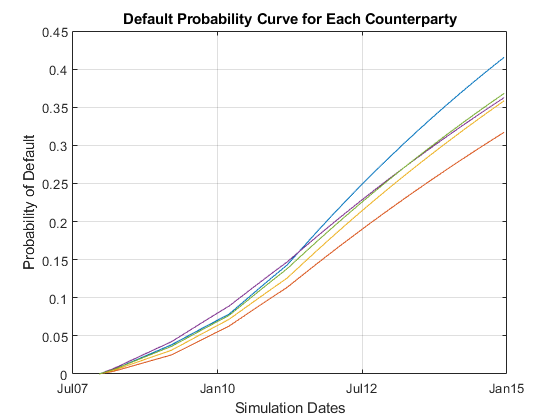 % Plot of the cumulative probability of default for each counterparty. Where R is the recovery, discEE the discounted expected exposure at time t, and PD the default probability distribution. This assumes the exposure is independent of default (no wrong-way risk), and it also assumes that the exposures were obtained using risk-neutral probabilities. where t_1 is today's date, t_2, ...,t_n the future valuation dates. Assume that the CDS information corresponds to the counterparty with index cpIdx. 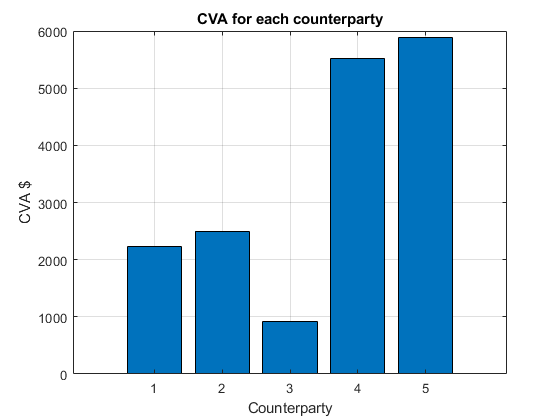 The computed CVA is the present market value of our credit exposure to counterparty cpIdx. For this example, set the recovery rate at 40%. Pykhtin, Michael, and Steven Zhu, A Guide to Modeling Counterparty Credit Risk, GARP, July/August 2007, issue 37, pp. 16-22. Pykhtin, Michael, and Dan Rosen, Pricing Counterparty Risk at the Trade Level and CVA, 2010. Basel II: https://www.bis.org/publ/bcbs128.pdf page 256.